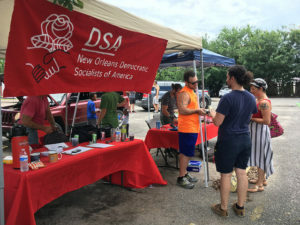 On June 16, the New Orleans chapter of the Democratic Socialists of America put on their 6th (!) Gimme a Brake Light event. 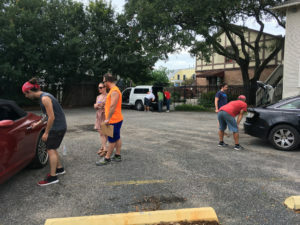 We had a dozen volunteers and 19 community members who got their brake lights changed and talked to us about their lives and experiences with police. We also partnered with a comrade from Debt Collective who was available to talk to people about how to renegotiate and resist debt. Why do we change brake lights? 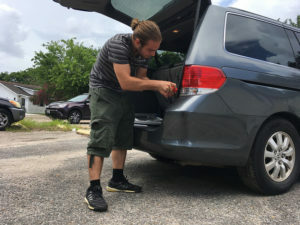 By changing brake lights for free, we aim to take small but significant action to protect one another from state-sanctioned violence at the hands of the police. We want the brake light clinics to open conversations in our communities about our police and prison systems and to get us thinking and organizing together for a different kind of system. Some of the people we spoke with had recent direct experiences with the police because of broken taillights, including one who received a full dressing down by an officer simply for having a newer car with a non-functioning light. The officer then preceded to chide the man and that he’d “better have a job” to pay the ticket. Another attendee was a construction worker from across the river who had had a taillight out for weeks but was too busy to change it, while simultaneously saying he was frequently worried about getting stopped for it. He did not know about the event in advance but saw our sign-holders and his wife convinced him to pull in and get his light changed. We also did one headlight change, for a participant who was on a fixed income and had the headlight but couldn’t afford to take into the shop to change it. Headlights aren’t typically our purview, but we got it done thanks to the tireless efforts of a comrade. As we come up to the one-year anniversary of the very first brake light change event, we’ve learned a lot. It was never enough to just change brake lights. This isn’t a charity project, but a way to highlight the contradictions between the capitalist police state and socialist equity. As such, we’ve worked hard to become more intentional about the ways in which we interact with people at the events – basic stuff in terms of having real conversations, inquiring and listening to other community needs and opportunities, encouraging people to learn more about democratic socialism, and making them feel welcome at our table. We have a long way to go, but with each clinic, we become better organizers – and perhaps more importantly – better members of our communities. The Health Care for All Committee shared the DSA vision for universal health care in the 7th Ward on Thursday, finding a receptive audience eager to share their struggles with capitalist medicine. The canvass was part of the national Medicare for All Campaign. This was the fifth Medicare for All Canvass, and the third in the 7th Ward. Ten organizers met with our neighbors about their health care experiences. Some shared difficulties they’ve had with the for-profit health care system. 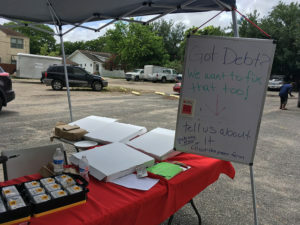 One organizer spoke with a woman on N. Galvez Street who could not get enough insulin and struggled to find a doctor who was accessible to her despite having Medicare. Overall, neighbors in this community were very receptive to organizers, and the canvassers collected about 20 signatures in about an hour and a half of organizing. The Health Care for All Committee will continue to follow up with neighbors we’ve talked to while organizing. The committee will collect more stories and engage neighbors who want to get more involved and volunteer. I’m Alli DeJong, a founding member of New Orleans DSA and the current co-chair. Over the past year I have led the bylaws drafting and revision process, represented us at the national convention, developed our incorporation paperwork, and assisted other organizers with our campaigns and actions. I’m running for re-election because I am proud of what we’ve accomplished together and I know we can accomplish even more in the next year: building our base through committee-led campaigns, growing our internal capacity, and becoming more involved in local struggles where a socialist perspective can shift public policy. I am a socialist with a MBA who can handle the regulatory, legal, and financial considerations, freeing our chapter’s organizer-members to accomplish extraordinary things. I will keep us connected to DSA National and other chapters, so that we can be a leading voice for socialist organizing in the Gulf South. I will do everything I can to make DSA New Orleans a powerful voice and force for socialism. I’m Michael Esealuka (she/her). I’m a restaurant worker and student. I got involved in socialist activity through my experiences in the Bacchanal Workers Union, a rank-and-file led union my coworkers and I founded. I’ve organized custodians and other low-income workers as a staff member of United Labor Unions. As a member of DSA I’ve helped lead the development of our Socialists of Color Caucus, and I was on the team that organized our Block out the Sun Yard campaign.As socialists and workers, we know that only an organized working class can leverage the power necessary to fight against capitalism. I believe that in order to become a force for poor and working people in both government and the streets, DSA must build a base of support by embedding ourselves into working class struggle through participation in rank-and-file labor activity, tenant organizing and the expansion of our mutual aid programs. Throughout my first term as co-chair, my aim has been to uphold democracy within the chapter and aid and coordinate the work of our committees. While we have more than doubled our membership this year and enjoyed some victories, we face challenges in keeping our members engaged, our campaigns focused, and our tools of political analysis and strategy sharp and effective. I remain committed to a chapter culture that is welcoming and educational ȉ one that enables us to learn from each other, build shared understanding, and take action together. As more eyes turn toward our movement, we have an historic opportunity to articulate clear ideas and organize campaigns that advance a socialist vision of society. People are listening. If re-elected, I will work with comrades on the Local Council to deepen our efforts to grow our active membership, clarify our vision, and wage effective campaigns in New Orleans and the Gulf South. Finally, the New Orleans Chapter of the Democratic Socialists of America is here! Democratic Socialists of America is the largest socialist organization in the country. We believe that our community — like the United States at large — needs Democratic Socialism as a remedy for the oppression of capitalism. This means that we believe in housing and healthcare as a right rather than a privilege, in living wages for all, in fighting for feminism and civil rights. Our organization also believes in fighting for local issues at a grassroots level. New Orleans is an amazing, one-of-a-kind city with unique problems all its own. We’re here to fight for environmental justice as our coastline is ravaged. We stand in solidarity with service workers in desperate need of better wages, with union workers fighting for a better quality of life. Everyone in New Orleans deserves housing despite the city’s shameful, rapid gentrification. We stand in opposition to the rampant racial and LGBT discrimination throughout the city. Simply put, we’re here to dismantle the injustices taking place in a city we love. The New Orleans Democratic Socialists of America is not a political party: it is a movement from the ground up. Join us in building a better future today! If you can’t make this one, we will be hosting an additional clinic on 9/16 at Barrone & Euterpe from 10 am to 3 pm!